I ran into a friend at the Hard Rock last week who turned me on to this unique event he is calling “Caravan to Cabo”, where five San Diego bands and a film crew will drive south to Cabo for Mexico’s biggest surf contest in history, Los Cabos Open of Surf starting June 16th. The surf contest will feature a two day music festival with Grammy nominated Los Amigos Invisibles headlining the event. Local bands joining the stage and the Caravan are: Todo Mundo, Sister Juanita, Ease Up, Hazmatt and DJ Man Cat. The surf event and music festival can be followed daily on the live webcast, a platform which last year had just under 1 million viewers tune in to watch their favorite surfers compete for a spot on the world tour at www.loscabosopenofsurf.com. With the surf contest starting the same day the caravan leaves San Diego, the surf webcast will perform daily updates of the caravan’s progress enabling viewers from around the globe to follow our local bands as they trek south through Baja. The adventure down Baja will also be captured on film for a documentary to be released early 2015. The film will be directed by local surf and music enthusiast, Eric Sorensen, a former professional surfer who now spends his days as the Creative Content Director for Osiris Shoes and the Marketing Manager for Blvd Clothing Company where he works closely with American rapper Soulja Boy. The goal of the documentary is to detail the epic Baja adventure as well as motivate surf and music enthusiasts of So Cal to join the caravan in 2015. “Caravan to Cabo” is the brain-child of local musician, Jonathan Savage, who played a show in Mazatlan Mexico in 2012 at a venue owned by the producers of the surfing event. Since 2012, Savage has booked nearly twenty California bands to visit and play shows in Mazatlan, a town he claims to have a vibrant and modern music scene. To Savage, “Caravan to Cabo” seemed like the next step in the direction to further connect the California music scene with Mexico, a place he claims has a rapidly progressing taste in popular music. Savage is not new to music event production having developed “Rock the Boat” in 2013, a first annual sold out event aboard a 500 capacity ship in Mission Bay which featured six bands including Dead Feather Moon, Deadly Birds, Pilot Touhill, The Tarr Steps, Oliver Trolley, and UpRooted. Next year Savage expects to expand the Los Cabos Open of Surf music festival to three days and include over 12 local bands to join the caravan. 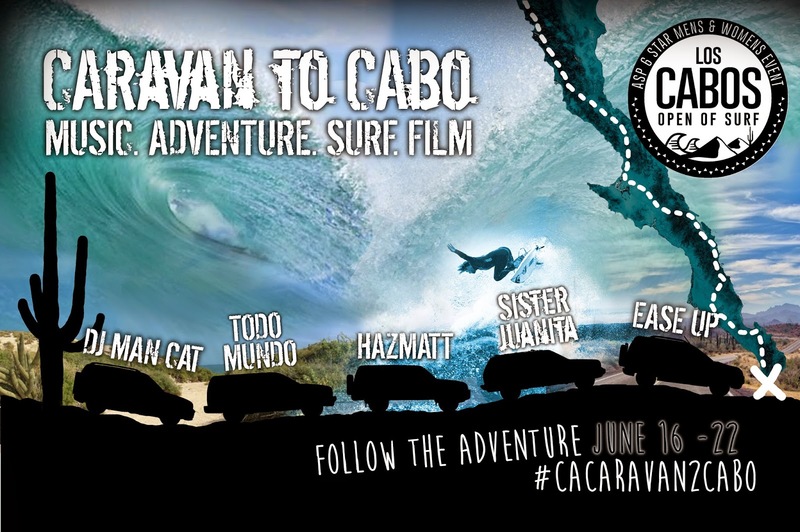 People can follow the adventure on social media as it happens at #caravan2cabo or follow the surfing webcast to see how these local bands handle the rough Baja deserts, the big stage at Costa Azul, and the party scene of this major surfing event. “Caravan to Cabo” bands Sister Juanita can be seen this Friday headlining the Casbah, while Todo Mundo can be found Sunday at the Belly Up. The bands will be collecting donations (new and used clothing and toys) at these local shows to be distributed as they drive down Baja, please contact the bands directly for more information on how to make a donation!